Featured in this classified ad from March 1973 is not one but the example of a truly unforgettable and historic sports car: the Maserati 450S Coupe. It led a fascinating life, from promising Le Mans racer to impossibly exclusive road car, and had more than a few legendary names associated with its construction and career. Rarely able to contest for outright victory in international sports car competition during the first half of the 1950s, Maserati knew they had to come up with a large-engined car to keep up with the likes of Ferrari and Jaguar. The 450S was Maserati’s 8-cylinder answer. Developed throughout the later part of 1956, the 4.5 liter engine made its competition debut at the 1000 km race in Argentina in the capable hands of Moss and Fangio. The new Maserati’s potency was more than apparent, and the car easily led the early stages of the race before being let down with clutch problems. This left the Ferrari of Gregory, Castellotti and Musso to take the checkered flag. Maserati had their revenge, though, at that year’s Twelve Hours of Sebring, with Fangio and Behra taking the 450S home in top spot. Other impressive finishes, including a win in Sweden, brought Maserati within striking distance for the World Sportscar Championship in 1957, but in the end the more reliable Ferraris took the crown. By the time rule changes left the 450S obsolete, about ten of them had been completed, and Maserati began to shift its focus away from its dangerously expensive racing programs. All of the 450S’s wore the sloping roadster body with protruding side pipes that has become a famous representation of that golden age of sports car racing. All of them that is, except for one: the Le Mans Coupe. Probably the most interesting of the 450S’s, this coupe body was actually fitted on chassis 4501, the Moss/Fangio car that debuted at Argentina. 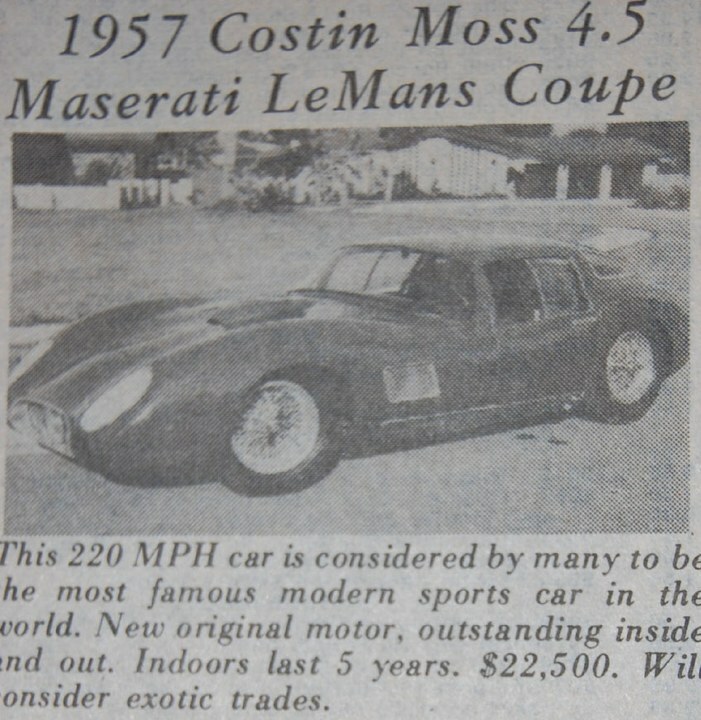 Hoping to capitalize on the long straights at Le Mans with a low-drag, high-speed car, Maserati hired legendary engineer and aerodynamicist Frank Costin to design a slippery, closed body that, it was hoped, would be able to allow the 450S to reach speeds of 200 miles per hour or above. Looking at the finished product, it is easy to see the Costin influences. The nose looks like a big Lotus XI, and the profile resembles the later Jaguar-powered Lister Le Mans car from 1963. Costin duly produced plans for the car’s shape, but the body was actually constructed by Zagato in Milan, who may or may not have followed Costin’s design exactly as it appeared in the sketches. At Le Mans, the Maserati definitely looked gorgeous, but the car supposedly improved just for Le Mans amazingly turned out to be slower than the roadsters. The air flow apparently piped hot air straight at the carburetors, starving the v-8 of valuable horsepower. Moss somehow got the car into second during the race for a time, but could not make it last and ended up retiring along with the other Maseratis contending for victory. An unfortunate disappointment, the Costin Zagato Coupe sat discarded until an American collector named Byron Staver bought the car with the intention of using it as a road car. The new owner, probably a bit taller than Stirling Moss, had Fantuzzi lengthen the car for more interior room. Around 1961, the Le Mans Coupe found its way to a Harry Heinl of Ohio, who must have known that he probably had the fastest road legal car around. At some point the car made it to Germany, where it could be seen at the Rosso Bianco Museum near Frankfurt. Now in the United States, the one-off Maserati has been restored and made the rounds on the Concours circuit. Over fifty years on, it’s just as unique and just as cool as it ever was. The car is advertised here in 1973 by one of the car’s several American owners. It is ambitiously described and priced at $22,500. In 2012 dollars, that comes to a little under $120,000. While that is certainly not pocket change, for a car rife with automotive buzzwords like Costin, Zagato, Moss and Fangio, it seems like a steal. Imagine what this car would bring if it crossed the auction block today. Just to fill in some blanks on the ownership of the 450S Coupe, the car was sold by Harry Heinl to Pete Sherman of Orlando. I believe it is Pete’s ad that appeared in your email article. I and a friend of mine, Bruce Tittel, responded to that ad and bought the car in the early 1970’s from Pete Sherman. We had seen that car on the cover of Road & Track in 1960 or 1961 when we were students in law school and vowed some day to own it if we could. I had it completely restored, mechanically as well as cosmetically, by Holman and Moody. While there it acquired the nick name of Messarati, only partly in jest. My wife and I picked the car up in Charlotte once the restoration was finished and open trailered it to Watkins Glen for a VSCCA event where it was reunited with Stirling Moss for a feature article by Bill Stahl in Automobile Quarterly. In speaking to me of his LeMans experience with it, Moss called the car the worst piece of c—p he ever attempted to drive. The best thing that came out of this meet for me was a friendship with Sir Stirling (and later, Lady Moss) that endures to this day. I found the car equally abysmal to drive, and it sat in my garage for years until I eventually sold it in the mid or late 1980’s to Peter Kaus. I lost track of it after that. I will have to agree that it was a wonderful work of automobile art….but as with most things, you can’t judge a book by its cover. In or around 1965 I ran into this car, or maybe the twin sister, in a garage in a northern suburb of Detroit called Center Line. The car was completely apart with most parts in boxes. The engine was completely apart. The garage owner and mechanic was Reg Hallums. His garage was called Automotive Shop, Inc. He was a 50+ englishman. Most of his clients drove Bugattis. I was amazed when 3 months latter I stopped by and the Maserati was fully assembled and running well. Unfortunately Reg, at the request of his wife, left Detroit shortly to manage a motel in Florida. He was trully a genius mechanically. That was certainly no bargain in 73. Even GTO’s were cheaper. I remember summer of ’73 David piper was offering #4675 for 7000 PDS (and my nearly 40 year-old handwriting in my notebook indicates that it was approx. $17,000 US). Of course they were half that 2 years prior, though by ’75 they were over $40k. I watched Moss drive this Maserati 450 S coupe at LeMans in 1957. It was not Stirling’s favorite automobile, but he still performed masterfully. The sound of the engine was exhilarating. Lots of us were disappointed when the car did not cross start/finish at the end.